Closing a runway for any amount of time is hardly a popular idea. However, San Francisco International Airport (SFO) recently found that a series of weekend closures was the best way to perform necessary upgrades at its busy airfield safely and efficiently. The airport scheduled nine consecutive closures between March 31 and June 5, and ultimately completed the job in seven. Two closures were cancelled because rain and high winds precluded construction work; and the airport kept the runway open during Memorial Day weekend. 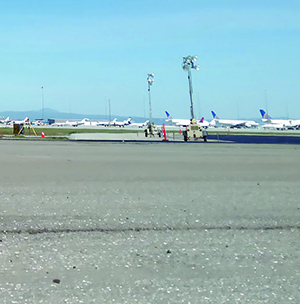 During the carefully coordinated closures, SFO repaved its second-longest runway, enhanced associated taxiways and updated various airfield systems. Together, the $43 million enhancements will improve operational efficiency at the high-volume facility, says SFO Project Manager Daniel Lee. Runway 28L was updated with a new asphalt surface layer and LED centerline lights. Crews also constructed a new secondary taxiway for departures on 28L, realigned an existing taxiway, and updated associated airfield electrical systems and pavement markings. When 28L was last resurfaced in 2008, SFO served roughly 37 million annual passengers. Last year, it served more than 53 million. 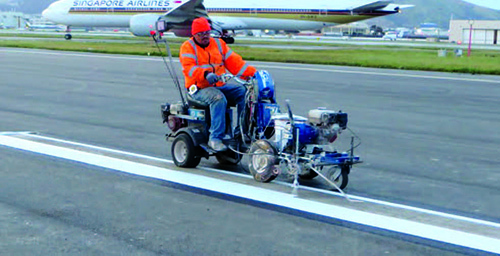 "That change alone was a huge impact to trying to do construction while keeping the runway operational," Lee relates. The airport, airlines, FAA and other stakeholders worked together to determine the best time to perform the work, he says. Although overlay work can be performed at night, repeatedly mobilizing and demobilizing crews and equipment for only six- to eight-hour shifts would have been inefficient and likely resulted in poor quality pavement, explains Lee. On the other hand, closing 28L for an extended period of uninterrupted time was also not a viable option. Together, 28L and 28R handle about 93% of SFO's arrivals. Eliminating half of that capacity could have created a national air traffic nightmare-a scenario SFO was not willing to risk, he explains. "Project planners ultimately determined that a series of weekend closures would be the best option. The strategy has proved successful at SFO in the past, notes Lee. To increase the odds of having dry conditions that contractors need for paving, the airport scheduled construction at the tail end of March. Because the airport has its lightest traffic on Saturdays, the runway closures were scheduled from Friday evenings to mid-day on Mondays. "Sundays and Mondays are also a busy time, but in order to get the most efficient product and the least amount of weekend closures, we had to take Sunday to complete the work," Lee explains. "It was a challenge." Crews performed some work, such as electrical upgrades, during overnight shifts, but paving required continuous daytime and nighttime hours. The series of weekend closures was carefully scheduled, coordinated and phased cooperatively with all stakeholders. "We were pushing our weekends and making sure that we utilized every single minute of our closures," Lee recalls. Some weekends, crews installed 16,000 tons of asphalt (enough to cover 16 football fields) in a single 58-hour work period. Game plans for the closures were scheduled down to 15-minute increments to make sure everything was finished on time, says Lee. Performing most of the work during weekend closures allowed contractor vehicles to avoid weekday traffic in and around the airport. They also sidestepped local weekday construction such as highway paving jobs. To meet current FAA standards, project engineers upgraded the asphalt binder in the new pavement for Runway 28L to a more flexible grade. The change is also expected to help the pavement last longer and remain more resistant to rutting and cracking, particularly during cooler temperatures. "Even though our airport has relatively temperate weather, that flexibility in the binder helps maintain the life of the asphalt much better than what we had typically used in the past," Lee explains. Each of the associated taxiway enhancements was designed to provide important airfield improvements. Taxiway F2, the new secondary taxiway located about 550 feet from the end of the runway, is engineered to provide air traffic controllers with more flexibility to hold planes and make changes on the fly. Taxiway S was realigned to improve the geometry of the airfield and enable aircraft entering Runway 10R to use its full length. In addition to paving, crews replaced about 43 miles of cable to refresh the airfield's electrical system. They also added runway status lights and upgraded centerline lights with LED fixtures that are designed to be more energy efficient and easier to maintain. Anticipating disruptions to flight schedules, SFO devised a plan to prepare customers for construction-related delays and cancellations. While the airlines collectively agreed on the series of weekend closures in advance, it was ultimately up to individual carriers how to adjust, or not adjust, their specific schedules. "We knew that these weekend closures would reduce the arrival capacity of the airport and, without any schedule adjustments, it would likely lead to delays and cancellations," says Doug Yakel, SFO public information officer. The airport consequently launched a preemptive communications plan in February, when the construction project was initially announced. Outreach efforts addressed passengers directly and through the airlines. The airport shared details about the project and related runway closures on its website and social media channels, but Yakel also felt that customers expect to hear such information from their specific airlines. "So our second approach was making sure that the airlines had the right information they needed," he says. Because each closure was different as the project progressed, there were varying levels of delays and cancellations to address. And weather was another wildcard in play. "Some weekends were more impactful than others, and we wanted to really give that granular information to airlines so they knew what to expect and how to communicate with their customers," says Yakel. Communication also figured prominently on the jobsite itself. With an extremely tight schedule, SFO relied heavily on partnerships and effective communication with contractors. "We have a partnering program that's really extensive," notes Lee. "Especially on a project like this, which is very fast-paced, we want to make sure that most of the decisions that need to be made can be done on the ground." During its recent $43 million runway/taxiway project, San Francisco International Airport (SFO) used a mobile application that helps manage jobsite access by scanning license plates and security badges. Developed in-house by airport staff, the app expedited traffic entering and leaving the construction area while also maintaining airfield security. Because the airport could not barricade off Runway 28L to make the work zone a landside project, it installed a construction gate to restrict the airside area to workers and equipment with pre-approved security clearance. 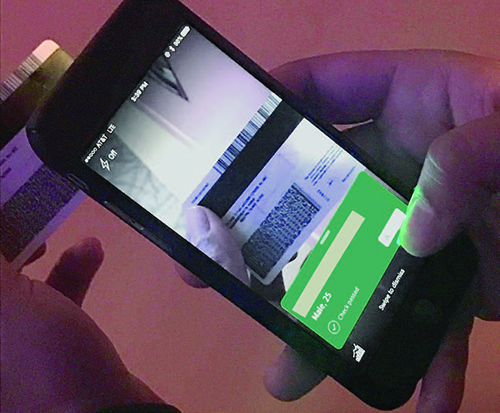 Personnel from SFO's information technology and security teams worked with TSA to develop an app that would save time and resources verifying security credentials at the jobsite. "In the past, we would hand write everybody's license and badge information," explains SFO Project Manager Daniel Lee. "That's really inefficient." During one particularly busy weekend of construction, about 1,500 vehicles passed through the security checkpoint. 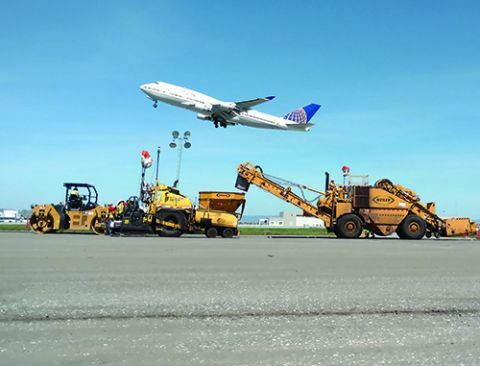 "The mobile app really helped automate the process of getting construction trucks on and off the airfield," reports Doug Yakel, SFO public information officer. Following the app's success on the airfield, the airport is now using it on other major projects, including the Terminal 1 redevelopment program, which is slated for completion in 2024.